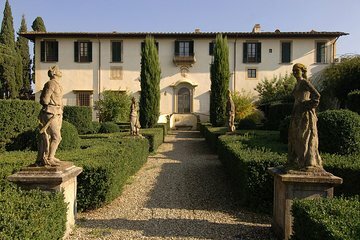 Enjoy a true taste of the Tuscany on a 3.5-hour dinner and wine tasting experience at a villa in the Florentine hills. Departing from Florence, a guide will lead the way to a 17th-century estate where you’ll tour the grounds and learn the winemaker’s secrets. In the private cellar, sip and swirl four limited-edition blends before topping off the night with a sumptuous 4-course Tuscan meal in the gardens. Your evening will conclude with drop-off back at your hotel in central Florence. Your tour will begin in central Florence near Santa Maria Novella Station, where you’ll hop aboard your minivan with your guide. Travel a short distance outside of the city center to reach the scenic vineyards and olive groves that surround the 17th-century villa. Take a tour of the picturesque grounds with the villa’s winemaker and listen to some of the secrets of the trade. Hear about the villa’s production process and learn how blends are created from merlot, cabernet sauvignon, sangiovese and pinot bianco grapes. Then, toast cin cin! Sample the villa’s limited-edition red, white and dessert wine, soaking up the characteristics of each. Afterward, take a seat in the gardens if the weather is clear, or inside the villa for a 4-course feast. Savor local specialties such as crostini, parmesan and Pienza pecorino cheese, prosciutto ham, a traditional meat dish and pasta, with vegetarian options available. Take in the villa’s panoramic views while you dine on the fresh ingredients of Tuscan classics. Don’t forget to save room for the traditional Italian dessert served after dinner. Your evening out will conclude with a smooth ride back to your original departure point in Florence. The short ride to the hills near Chianti from downtown Florence took about 15 minutes. The villa was gorgeous, the guide (Lizzy) was knowledgeable and so nice, and the grounds surrounding the place we serene and tranquil. Even the owner came out and spoke with us for about 15 minutes, divulging some of his family history. Once the hour-long tour was complete, you tasted the wine and had a 4-course meal. Everything was delicious. I've been to Italy a dozen times, and have done many wine tours. 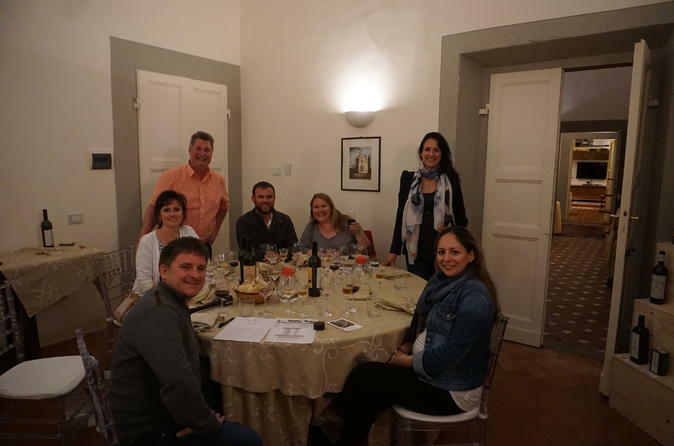 This experience was perfect, because you received the best of Italy--a beautiful villa, great wine, and delicious food--without sitting on a bus for hours and driving from town-to-town, like traditional wine tastings. What a wonderful evening! Great food, wine and company. Alejandro was so knowledgeable and friendly. Beautiful villa! Lizia was a wonderful tour guide! We learned a lot and had a terrific time. She went out of her way, and off the schedule, to make sure we got great sunset pictures. The trip was very well organized from start to finish. Since the villa is close to Florence, we didn't waste a lot of time in the van. Dinner was delicious. There was more than enough food and wine for all. It was a relaxing evening learning anout wines and meeting new folks from around the world. Our daughters ( 20 somethings) gave the tour a big thumbs up, too! This was really an interesting and enjoyable outing and dinner. The vans picked up our group right on time and arrived at the villa in about 15 minutes. Our guide took us through the interesting vineyards, explaining the process, then the wine processing facility, and then the wine cellar under the beautiful house. The house was beautiful and even offered a bed and breakfast and a nice swimming pool. The owner of the property happened to come by and let us into the quaint private family chapel attached to the house. Then we had a very enjoyable dinner and wine tasting in the dining room of the house. Our guide was a very knowledgeable and passionate sommelier, so she explained each of the wines. The food was very good, and once we started eating and drinking, our group became very friendly and talkative. It was really a lot of fun and I would highly recommend. This evening was a highlight of our time in Florence! We had 8 people in our group and we were joined by 4 other guests. The instructions were easy and the representative was very easy to locate near the main train station. We were driven to the villa in two large SUVs. Our host for the wine tastings/dinner, Laura, was fantastic! She was fun and warm and knowledgable and was completely at ease in encouraging conversation and bringing everyone together. She is getting her sommelier accreditation and she was an excellent guide for the evening, providing us with historical information on the villa, food and wine, and daily life in Florence. The villa was lovely and the evening included a tour of the property, wine tasting in the wine cellar and dinner/wine tasting in one of the dining rooms on the main floor. Overall, we were all very happy with this Dinner/Wine Tasting and would highly recommend! We really enjoyed our tour and the dinner. Our guide was very knowledgeable and treated us as a guest in the Villa. Was a very enjoyable evening! This villa on its gorgeous grounds is a small-producing winery. It makes excellent olive oil and wines that are not marketed but only sold on the estate. We toured the grounds, learned the wine-making process, tasted several full-glasses of wines with aperitifs in the cellars, and had a fabulous dinner in the dining room. Very, very fun, and we highly recommend it! Our guide Laura was charming,knowledgable and entertaining. She imparted her knowledge without being stuffy. The setting was beautiful but inviting. We enjoyed the whole evening immenslely. Would most assuredly do it again. It will be wonderful to enjoy the wines we bought and relive the evening at home. Great night out! We had a lot of fun on this tour we found out a lot of great information about the villa and the wine making process. Our tour guide was very informative and friendly and helped to make the experience a great one. Food was really good and the wine was flowing we also met some lovely people on the night which contributed to a great night. The Villa is amazing, the food and wine were exceptional and our guide Julia was fantastic. All in all a fantastic evening!